Housing.com cofounder CEO Rahul Yadav's decision to gift his entire 4.57 per cent personal stake worth Rs 150-200 crore to employees has taken everyone—including investors, other co-founders and senior executives—in the company by surprise. Though Yadav made light of the overture saying he is "just 26 and it is too early in life to get serious about money", according to insiders, there is more to it than that meets the eye. Yadav's decision has taken the entire top leadership and the board of directors by surprise because it came barely five days after investors, including SoftBank, Helion Ventures and Nexus Venture Partners, had committed at the board meeting to part with a small portion of their stake to create a larger pool for employee stock options. Prior to it, all co-founders had also decided to give away a portion of their individual stakes to the ESOP pool. So, Yadav's sudden and dramatic decision to gift all his shares to employees has not gone down well even with his close colleagues. This also gives rise to speculations about his eventual exit. 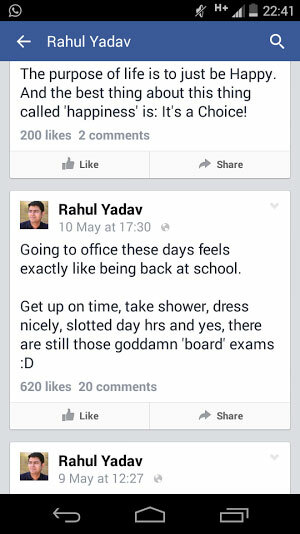 Also, Yadav is trying to endear himself to the employees, whose support he needs in his battle with the board. Yadav justified his move saying he is focused on creating a global giant in online housing search rather than getting obsessed about making money. "There is no other factor at play," he said. Interestingly, the rumoured value of Rs 150-200 crore for Yadav's stake of 4.57 per cent in the company is contested by senior colleagues and investors themselves. The company was valued Rs 1,800 crore at the time of last fundraising in December. This makes his holding worth Rs 82.26 crore unless the company's valuation has dramatically increased in the last four to five months, according to a source who did not want to be named. Yadav did not directly respond to a mail seeking his comments. Jaideep Shergil, CEO of public relations advisory service Pitchfork Partners and Yadav's spokesperson, responded saying he would get back but a response had not come till this report was filed. Another question is whether Yadav can gift shares to employees without the board's approval. Usually founder shares come with riders like first right of refusal, and unless other shareholders and investors waive this right the shares cannot be transferred. So as of now Yadav's proposal could just be simply an announcement and could only be effected through a board approval. This puts the board in a quandary as it will invite employees' wrath if it fails to approve Yadav's share transfer proposal. All told, Yadav's move is going to give sleepless nights to the board and investors. Yadav, who had severe differences with the investors and the board over strategy and also because of his penchant to get into public spats, is clearly not an easy entrepreneur to work with as nobody can second guess what he would do next.